Cool. i havent done these giveaways in such a long time. i pray that i’ll get a better chance. i love your on facebook already. already have and will always like you on facebook. no doubt about it. I saved big at Target tonight! I’d love to win a gift card! I always check in to TotallyTarget on Facebook to see what’s new! Nice giveaway and great website. Thank you for the give away! The gift card is so neat! My little one would definitely keep busy with it. I love the gizmo toy gift cards in these contests. I am a Totally Target fan on Facebook. I would love to win this giveaway. Thanks! I love to shop at Target I can find almost anything I need there. Coolest card ever!!!! Thanks for the chance!! What a great giveaway and collectible at the same time! I love your giveaways. Thank you for the opportunity and all that you do to save at Target! Love this gift card! Too cute! Yipee! Thank you for the chance! Such a cute card my kids would love it! We could always use one of these here. Thanks for the wonderful giveaway! 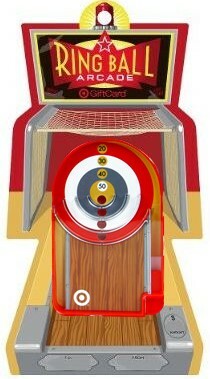 Love the card, I love to play skee ball! I “love” TT on FB! Would LOVE to win this card! !